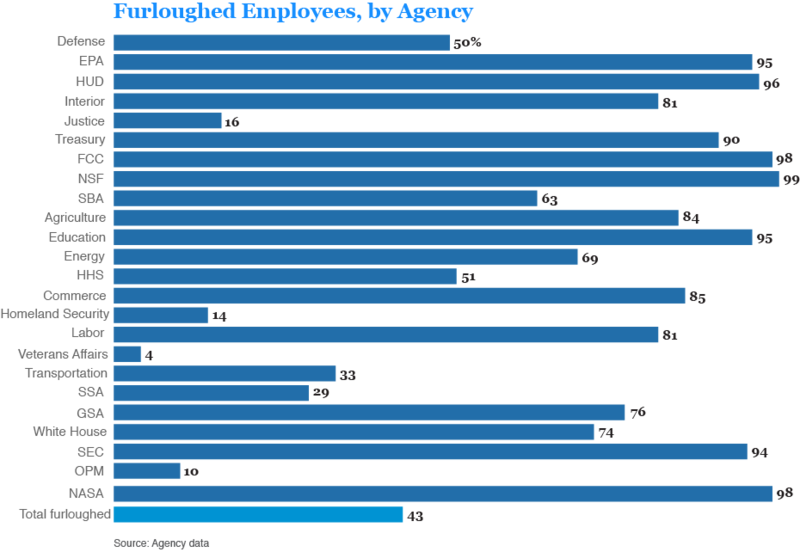 While surviving the anarchy of the government shutdown, I came across some figures regarding the “essentialness” of the employees of certain government agencies. For example, apparently only 6.6% of the employees of the Environmental Protection Agency remain on the job, resulting in all sorts of “ineffeciencies”. The shutdown will also delay the comment period for the EPA’s New Source Performance Standards – the proposal that would make it nearly impossible to open a new coal plant – which started on September 20, 2013. I’d think twice about simply moving to restore pre-shutdown funding to the government. It would be nice to dust off actual budget proposals and start talking about what the government should do and how much (or how much little) it should spend in pursuit of those goals. What sort of teachable moment is it when freaking Republican “anarchists” (Harry Reid’s term) are tripping over themselves to restore full funding for the Depts. of Interior, Education, Commerce, and Labor? Or blithely re-upping the Transportation Security Administration, the Drug Enforcement Administration, and the FCC? It’s teaching a lesson, that’s for sure, and it’s one about how different Republicans are from libertarians, especially when it comes to determining how we should be spending. I disagree a bit with Gillespie’s last point: beltway Republicans are different than libertarians, to be sure, but they also differ from members of their own party from outside the beltway (some of those Tea Party anarchists!) as well as mainstream, fiscally conservative Americans of any party. ← Bait and Switch Bridge Toll Commission? The ugly truth about the federal government is there are far too many people in it, and most of them are paid very generously to do little work on a "when I get around to it" schedule. The facts that federal employees are essentially impossible to fire and are paid the same regardless of performance create an incentives problem. Telework – touted by the President as a "no-brainer" and "win-win" for all parties, is a terrible scourge that has destroyed anything resembling a team office culture. On a given day, around 30-40% of the agency workers are at home, and its an open secret that telework days are little more than vacation days in which the employee is "on call" for simple online requests but otherwise free to go about their personal business. As with any organization, there are high performers in the federal government, and not all of the employees are soulless time-serving bureaucrats. These people tend to be younger, earn less money, and have higher credentials, such as law degrees, masters degrees, or PhDs. One worry I have is that the shutdown will disproportionately impact and dissuade these high performers and either encourage them to leave federal service – making every federal agency operate more like your local DMV – or turn them all into yet more actively disengaged union grievance mongers, complaining about their lots and counting the days until retirement. Far too many of those federal employees already. I've long thought that if I was Governor, I'd simply have a press conference and make it widely know that "Tomorrow, all non-essential state employees are required to stay home. They will be paid for this day." Then that day is the last day of work for everyone who stays home. Basically if you view yourself as non-essential, then you're not needed. Let's trim this thing down to just what we actually *need* and then we can replace a number of those people with more in areas that are truly needed. I have an even simpler solution for the glut of superfluous federal employees. After confirming the networks are working, tell everyone they have 15 minutes to submit whatever they've produced over the past month for managerial review. At least 50% of the workers in your average federal agency wouldn't even come close to surviving such a culling. I knew a disgruntled federal employee in 2010-2011 who was close to retirement and literally did nothing for his last two years. He just came in, went online, produced no work, and went home every day. His manager knew exactly what was going on and did nothing because there was no incentive to remove him and they didn't want a long union fight when he was leaving anyway. Without the benefit of an edit option, I should add here that the employee in my example earned $130,000/year plus benefits during that period. So Reid calls Cantor's bill to restore funding to the NIH a crazy idea? Odd that someone who is willing to deny cancer patients their treatment would be calling others crazy. Dan: "I knew a disgruntled federal employee in 2010-2011 who was close to retirement and literally did nothing for his last two years. He just came in, went online, produced no work, and went home every day. His manager knew exactly what was going on and did nothing because there was no incentive to remove him and they didn't want a long union fight when he was leaving anyway." I have seen that at every level of government. I think this is a result of unions. Is it any worse than when GM had to maintain lunch rooms full of employees, on the payroll but doing nothing? They were there "in case they were needed". How about maritime union rules that required 5 engineers, when the ship only required 4. The ships sailed with 4, who split the pay of the 5th "whose job they were doing". Wonder why it became hard to find an "American Flag" ship. Those who recall the regular wheat sales to Russia may not know that one of the big haggling points was whether it would be transported on American "bottoms". Subsidy to the Merchant Marine, perhaps reasonable. But it cut into the subsidy to farmers.